DiskSavvy is optimized for modern multi-core and multi-CPU systems and is capable of parallelizing disk space analysis operations to an unlimited number of CPUs. 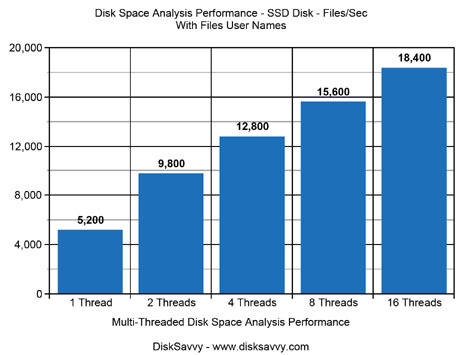 DiskSavvy provides a number of different performance optimization options allowing one to tune disk space analysis operations for user-specific hardware and storage configurations. 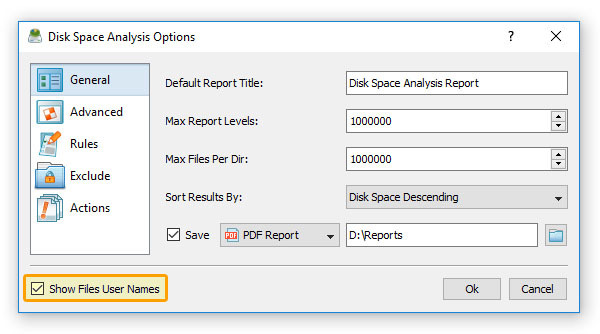 In order to access the disk space analysis performance optimization options, open the disk space analysis options dialog and select the 'Advanced' tab. The 'Dir Scan Threads' option controls how many parallel disk space analysis threads are used to scan input disks, directories and network shares. In the 'Fault-Tolerant' directory scanning mode, DiskSavvy uses an individual processing thread for each input disk, directory or network share, but limits the maximum number of parallel scanning threads to the specified value. In the high-performance directory scanning mode, DiskSavvy always uses the specified number of parallel directory scanning threads even when processing a single input disk or directory. 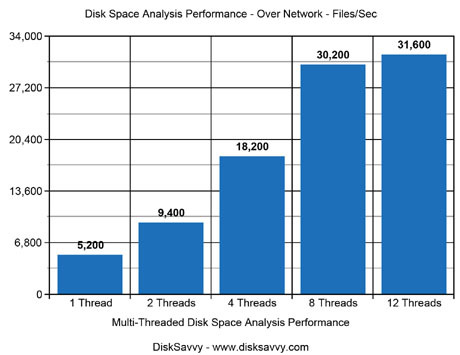 DiskSavvy provides the ability to show disk space usage statistics per user, but this capability significantly slows down disk space analysis operations especially when analyzing files via a slow, high-latency network. By default, due to performance considerations, this option is disabled and if the user needs to enable this capability, it is highly recommended to install DiskSavvy on a modern multi-CPU or multi-core server and configure the disk space analysis operation to use at least 4 parallel directory scanning threads. 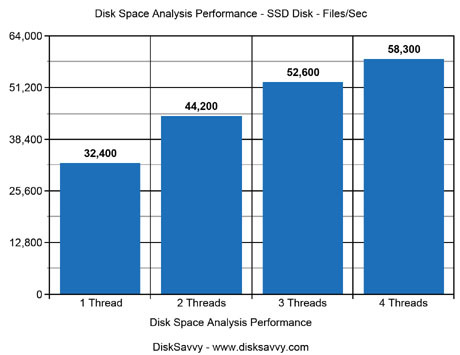 For example, when analyzing files stored on a local SSD disk, the speed of the disk space analysis process reaches up to 32,400 Files/Sec using a single directory scanning thread and scales up to 58,300 Files/Sec when the same set of files is analyzed using 4 parallel directory scanning threads. 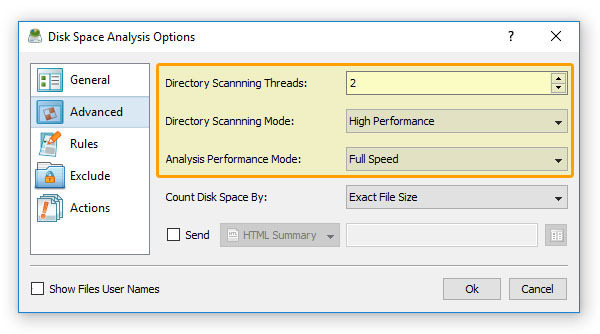 When the same disk space analysis operation is performed with the option to process and show user names enabled, the speed of the disk space analysis process reaches up to 5,200 Files/Sec for a single directory scanning thread and scales up to 18,400 Files/Sec when the same set of files is analyzed using 16 parallel directory scanning threads. The operation of inquiring the user name for a file is a relatively slow operation, which takes a considerable amount of time and in order to mitigate the performance degradation it is highly recommended to use at least 4-8 parallel directory scanning threads even on a dual-core or quad-core system. 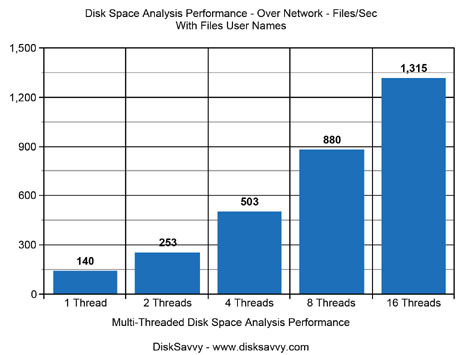 When a disk space analysis operation is configured to use multiple directory scanning threads, DiskSavvy will inquire user names for multiple files simultaneously thus significantly improving the speed of disk space analysis operations. The speed of disk space analysis operations performed over the network highly depends on the network latency and the number of parallel directory scanning threads configured for the disk space analysis operation. Also, if the user needs to analyze a single network share containing millions of files, it is recommended to use the 'High-Performance' directory scanning mode, which uses multiple, parallel directory threads even when analyzing a single input directory or network share. For example, the speed of a disk space analysis operation performed via the network reaches up to 5,200 Files/Sec when configured to use a single directory scanning thread and scales up to 30,200 Files/Sec when the same disk space analysis operation is performed using 8 parallel directory scanning threads. Inquiring the user name for a file over the network is a very slow operation which significantly reduces the performance of the disk space analysis process and in order to reach an acceptable analysis speed, the disk space analysis operation should be configured to use the 'High-Performance' directory scanning mode and at least 8 parallel directory scanning threads even on a dual-core or quad-core system. For example, a disk space analysis operation performed over the network with the option to process and show user names enabled, reaches just 140 Files/Sec using a single directory scanning thread and scales up to 1,315 Files/Sec when the same operation is performed using 16 parallel directory scanning threads.